The U.S. states of Alabama and Mississippi have pooled resources to do their part: www.masgc.org/cleanmarinas/index.htm. "The Clean Marina Initiative is a voluntary, incentive-based program (...) that encourages marina operators and recreational boaters to protect coastal water quality by engaging in environmentally sound operating and maintenance procedures. 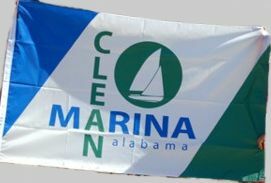 While Clean Marina Programs vary from state to state, all programs offer information, guidance, and technical assistance to marina operators, local governments, and recreational boaters on best management practices (...) Participation in the Clean Marina Program is entirely voluntary, but participating marinas receive a weatherproof Clean Marina flag to fly at their facility and authorization to use the Clean Marina Program logo on company publications." At the moment a limited number of marinas has been certified but the flag is flying! Basically the large logo on above page is placed on a flag, not a common (bi-state) one but a local variant mentioning the particular state's name. The logo consists of a green disk bearing a white yacht, sailing towards the left, and large words to the left of the logo 'CLEAN' (green, vertically arranged) and 'MARINA' (blue, horizontally arranged) underneath it. Also in a horizontal position - at least on the common logo - are the state names in a lowercase font 'alabama.mississippi', blue, just below 'RINA'. This page (bottom) offers a drawing of the flag (geographically unspecified): www.dogrivermarina.com/. The logo is set between a blue hoist triangle and a green fly triangle. These triangles do not completely cover the edge against which they are placed. The real thing, mentioning 'alabama', can be seen here (Mobile County marina recognized 19 Jun 2008): www.masgc.org/page.asp?id=226. Although I have not found photos of its Mississippi counterpart, it is reasonable to suppose that the sole design difference with above version would be the state's name.